For Part 2 of Shelby's birthday dessert-stravaganza (see Part 1 here), I did a little experiment. I've gushed before about how Omnomicon is one of my favorite food blogs, but I don't think I've ever made one of Aleta's recipes before today. She recently made a chocolate ice cream cake from a vintage cookbook. This cake shattered my belief that ice cream cakes must be frozen. No, my friends, for this cake, softened ice cream is mixed in with a box of cake mix and then baked. Aleta made hers in a bundt pan, but since my bundt pan hates me, I decided to make cupcakes instead. I will never make another chocolate cake recipe as long as I live. Seriously. I'm not the biggest chocolate cake fan, but this is hands down the best I've ever made. It's incredibly moist, and the flavor's perfect. You can use any variety of ice cream and cake mix, but I stayed basic with Ben & Jerry's chocolate ice cream and Betty Crocker chocolate fudge mix. This recipe made 24 regular cupcakes and 24 minis. 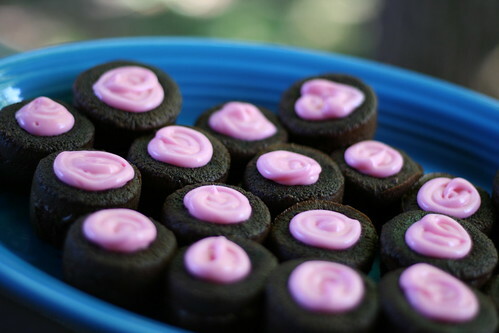 I used Deb at Smitten Kitchen's cream cheese frosting recipe, and tinted it pink, Shelby's favorite color. For the regular-sized cupcakes, I used my favorite frosting injection technique. YUM. 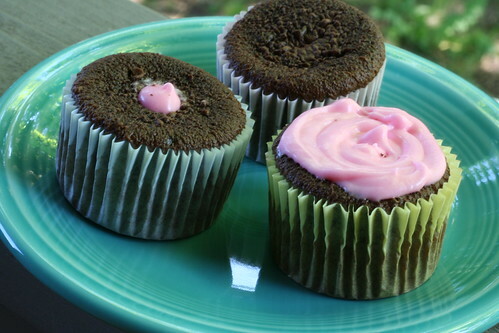 To make cupcakes, line cupcake tins with paper liners or spray with baking spray (I like the Crisco brand with flour). To make a cake, grease a tube or bundt pan, then dust with cocoa powder. Beat all ingredients together for 4 minutes. Pour into tins or cake pan and bake 17 minutes for regular cupcakes, 12 minutes for mini cupcakes, and 45 minutes for a cake. Serve with a dusting of confectioner’s sugar, a thin icing, whipped cream or the frosting of your choice. Those are adorable. I also love Aleta's blog, I must have missed these. What an awesome idea, and it sounds like something you can whip up pretty quickly too. these were so amazing. love your blog!!! your photographs are perfect. I love the colors of those cupcakes - they look delicious! This sooo reminds me of Bakerella's cupcake pop recipe - mix baked cake with icing and roll into balls...I never would have thought of doing anything with cake other than baking it and putting icing on top. I'm definitely trying this one. New to your blog - super cute! These look awesome. I can't wait to try them. I love any kind of "cheater" cakes (especially when your friends ask and you just smile)! I saw this too. I'm gonna have to give it a try one of these days. The cupcakes look great. Has anyone made these ahead and frozen them without the frosting? Hi Susan, I haven't frozen these, but can't think of any reason why it wouldn't work. If you try it, let us know how it works out!